Donald Trump Abandons Pledge To Support Republican Nominee : The Two-Way In the first Republican debate last August, Donald Trump would not promise to support his party's eventual nominee. In September he signed a pledge to do so. Tuesday night, he reversed himself again. 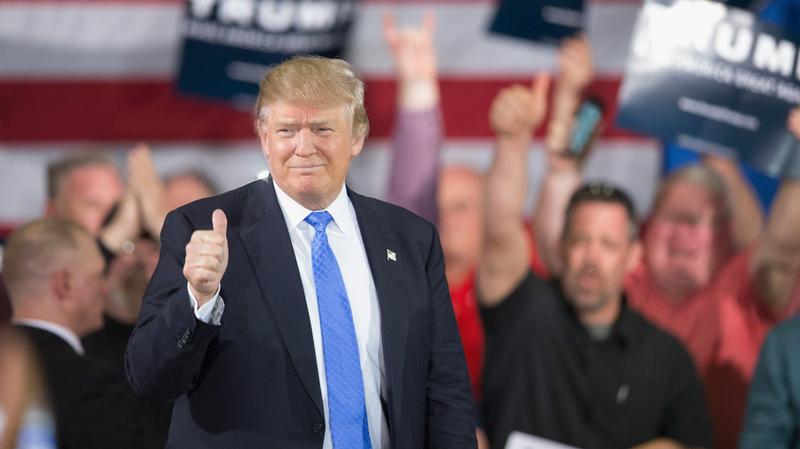 Republican presidential candidate Donald Trump campaigning Tuesday in Janesville, Wis. The Wisconsin primary is next Tuesday. Last September, Republican National Committee chairman Reince Priebus pushed the GOP's presidential candidates — there were 17 at the time — to sign a loyalty oath to the party. The party leadership was unnerved by Donald Trump's refusal at the first Republican debate, in August 2015, to endorse the eventual nominee for president. But in September all the candidates, including Trump, signed the pledge. Now, with only three candidates remaining in the race, the loyalty pledge appears to be all but dead. Tuesday night during a CNN town hall in Milwaukee, Wis., moderator Anderson Cooper asked Trump whether he is sticking with his pledge to support the nominee. "No, I don't anymore," Trump said. "No, we'll see who it is." And with respect to his contentious relationship with Texas Sen. Ted Cruz, Trump appeared to release Cruz from the pledge as well. "Honestly, he doesn't have to support me," Trump said. "I'm not asking for his support." Cruz has dodged the question of whether the pledge still holds by insisting he will be the nominee. Though on Friday, in an apparent reference to Trump, Cruz said, "I don't make a habit out of supporting people who attack my wife and attack my family." Ohio Gov. John Kasich, also appearing on the CNN town hall, hedged as well. "I got to see what happens," he said. "If the nominee is somebody that I think is really hurting the country, and dividing the country, I can't stand behind them." Kasich may have been speaking for all the candidates when he added, concerning the pledge first raised at last August's debate, "You know, frankly, all of us shouldn't have even answered that question."